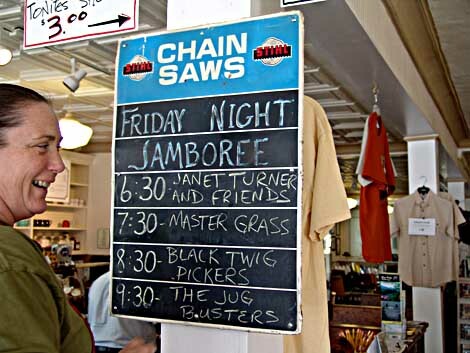 Ann Bower has just finished freshening up the roster of musicians for tonight’s Friday Night Jamboree at the Floyd Country Store. There will be some fine local musicians playing on stage and on the street around the store. The weather appears to be cooling down so it should be a great night to wander down South Locust Street and listen to the groups of musicians playing Bluegrass music. You will find that it’s had to resist the infectious beat of this traditional music. After a few seconds, you will find yourself tapping out the rhythm and possibly doing a little flat-footing. It is a great way to meet new friends and renew old acquaintances. My neighbor Tom King, who is almost my age, has just purchased a set of shoes with taps and has been practicing his footwork. I will be looking for him tonight to cheer him on. If Bluegrass is not your thing, you might check out Cafe del Sol, the Blackwater Loft, or the Over the Moon Gallery to see what live music offerings are on tap for tonight. Friday night in Floyd is fun for the entire family. We have 6 year old cloggers and 70 year old cloggers and they sure do dance up a storm. I will see if I can capture a few minutes of the fun on video. Hope you are ready for a fun and relaxing weekend, wherever you are. This entry was posted in Seen around Floyd and tagged Floyd Country Virginia, Friday Night Jamboree, Woody Crenshaw. Bookmark the permalink. I wonder if I could get a guest slot with my silver flute?